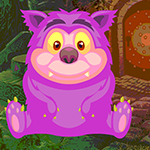 G4K Find Ugly Beast Game is another point & click escape game developed by Games4King. There were a few houses in a forest where an an ugly beast lived. The beast was not ugly on the inside. He just looked kind of silly. It is your duty to save that beast from the house in the forest. Find all the clues and solve puzzles to save that ugly (silly) beast from there and congratulate yourself for winning the game. This game is highly desirable for those who want fun! Good luck and have fun! Thank you TrubbleBubble, I was having the same trouble! Ugly to find the butterfly place. Ruined all the game.